It just may be one of the most underappreciated health problems in the U.S. today: As many as one in five children experience a mental disorder in a given year. The effects can be lasting, reducing their life satisfaction and productivity for years if their symptoms go undiagnosed and untreated. 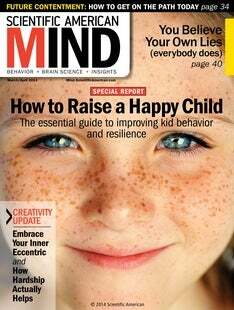 For these reasons, in this issue's special report, “Calming a Child's Mind,” we highlight emerging therapies for the three most prevalent childhood disorders—anxiety, behavior or conduct disorder, and attention-deficit hyperactivity disorder (ADHD). Psychologist Jerry Bubrick leads off the section with his account of helping several young patients overcome anxiety in “New Therapy Helps Children Wallop Their Worries.” In “Parent Training Can Improve Kids' Behavior” staff editor Ingrid Wickelgren drops in on a parent-training program that helps moms and dads build healthier relationships with their recalcitrant offspring. And contributing editor Emily Laber-Warren explores a growing trend to treat signs of ADHD at ages four or five, before the disorder can be officially diagnosed. Rough patches in childhood can become defining moments, helping to shape many aspects of personality. One such facet is how strongly you strive to either stand out or fit in. Psychologist Hans-Peter Erb and biologist Susanne Gebert explore the forces at work in forging character in “Embrace Your Inner Eccentric.” To make the most of your special traits, you must be able to think critically about who you are—a skill that psychologist John D. Mayer calls “personal intelligence.” In “How to Plan for Your Future Self,” Mayer describes the role of personal intelligence in setting realistic goals and feeling in tune with your future self. The adage to “know thyself” is as relevant today as it was in the time of ancient Greece, but the tools we can use for that discovery are changing rapidly. We possess stronger, more effective methods for improving well-being than ever before—and that is welcome news for all of us.